Will you dare to plunge your hand into the bubbles to see what “surprises” lie beneath them in our Witches Bubbling Brew? Challenge your kids to dip their hands into the bubbles to seek and find each of the ingredients contained within the witches brew. This Halloween sensory play activity is ideal for toddlers, preschoolers and older children to play along with together. Add a dash of washing up liquid (dish soap). 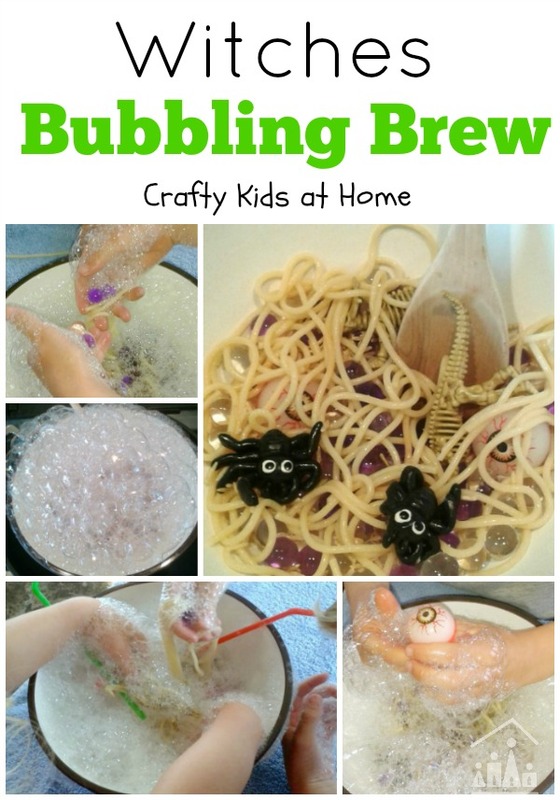 Pop in a straw and blow bubbles until all of the ingredients are hidden beneath the bubbles. 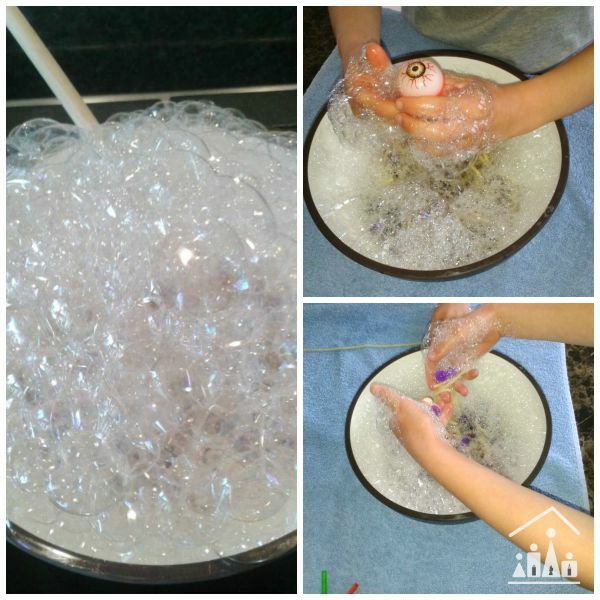 Hiding the ingredients under the bubbles add another level of spooky Halloween fun to this sensory activity. Prepare yourself for the squeals of delight when you show it to your kids! I set the bowl down in the centre of the table on top of a towel. I then asked each of my children in turn to find one of the ingredients by searching through the bubbles with their hands. This resulted in lots of squealing and giggling as they searched and stumbed against the different materials and textures. 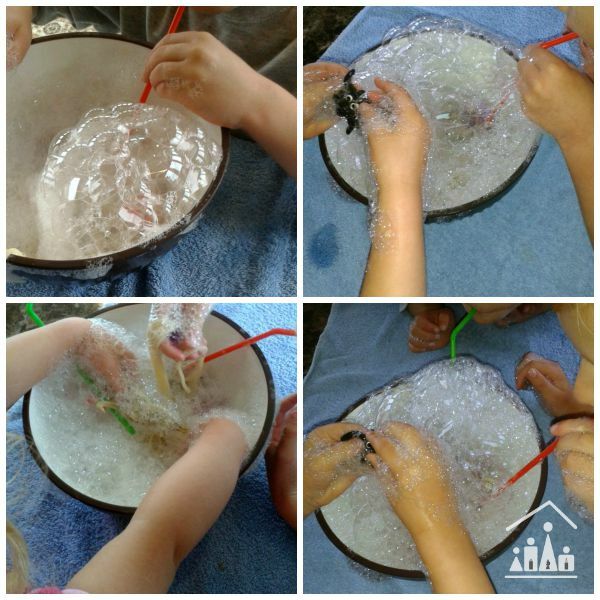 After they had each had a turn, they then blew through the straws to make even more bubbles! This then made it harder (and scarier!) for the next person to find their ingredient in the witches brew. They soon got bored of taking it in turns though and decided to all dive in together. They had such fun pulling out each of the ingredients out and waving them around to “scare” each othe. The more they played with this activity the more bubbly it got! My little girl thought it was absolutely hilarious, as the bubbles kept getting bigger and bigger and she just wanted to keep making more! You could make this activity even spookier by adding in some food colouring to turn it a different colour. Vary the contents to make them more or less spooky depending on your own children’s tastes. Make some bubble pictures along the way as well by placing a sheet of paper down onto the bubbles during the activity, if you have added in some food colouring. What ingredients would you add in to your “Witches Brew”? Love this! Perfect Halloween sensory play. Pinned! It has so many possibilites Totschooling we'll definitly be brewing up some more recipes! This is just perfect for Halloween – great idea! Thanks Emma! My boys are so excited for Halloween already so we had to get started on our activities! oh my girls would love this activity! really nice! Thanks hope you get chance to have a go at it! Brilliant!! Great idea for Halloween! Thanks! It's great as well as you can add in whatever your kids like as well. Water beads are brilliant in shaving foam as well you have to try that with them! Thanks! It's just gross enough to please my kids aged 6 and under there were lots of "urrgghhhs" going on! Thanks it was great fun to do! My daughter was in hysterics blowing the bubbles. She just kept wanting to make more and more! They had a fab time with this one! Definitly one of our favourites so far! Mums are definitly allowed to play Deborah i enjoyed it nearly as mcuh as the kids did! I hope you get chance to have a go as it was great fun. A disgustingly fabulous activity, perfect for Halloween. Thank you! We just cannot wait for Halloween! What a fab idea. I bet that was fun. I think my 3 would love it, I might just have to try something like that. I d definitely recommend giving it a try! Love this idea! I can only imagine how my son will react to those textures!! It was really fun watching my kids pulling out the different things. It's amazing how by giving something ordinary a different name can change their perspecitve on how it feels etc. Ooohhh! We need to try an activity like this! It's a great on to have prepared in advance and then just bring it out once you are ready for it. Halloween is a great time for so many fun arts and crafts activities it's one of my favourite times of the year. Thanks. Just added your badge now! Thanks! Enjoy if you do have a go. This post has been my most popular so far so i m delighted we wrote it up now!